LinkedIn Groups can be both bane and boon. On the one hand, they can be filled with spam and self-promotion. On the other, they provide sources of intelligent discussion and thought-provoking insight. 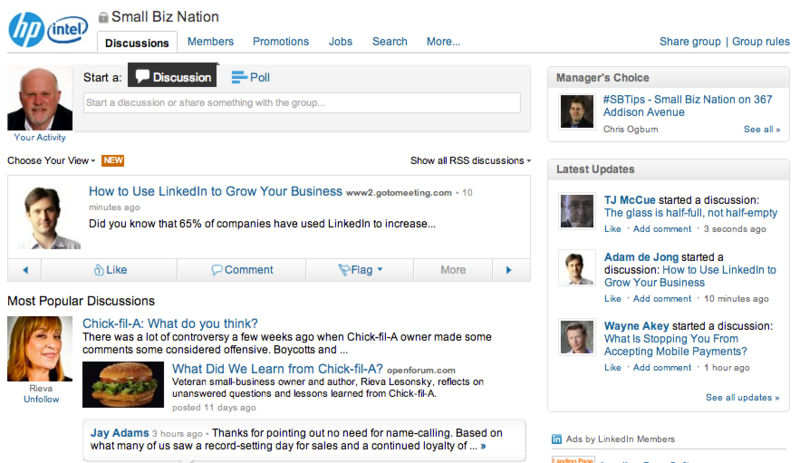 The 10 LinkedIn Groups in this list represent the latter category and are worth consideration by ecommerce merchants who want to expand their horizons and benefit from the diverse perspectives of other small business owners and marketing professionals. Unfortunately, many of LinkedIn’s ecommerce groups — at least the ones with which I am familiar — are not well maintained or monitored. As a result, they then to fall prey to spammers. This group, however, is different. With more that 71,500 members and 19 subgroups, it is one of the largest and most active groups in the ecommerce category. The group is owned by Oliver Luxon, global initiatives manager at the ecommerce company PFSweb. 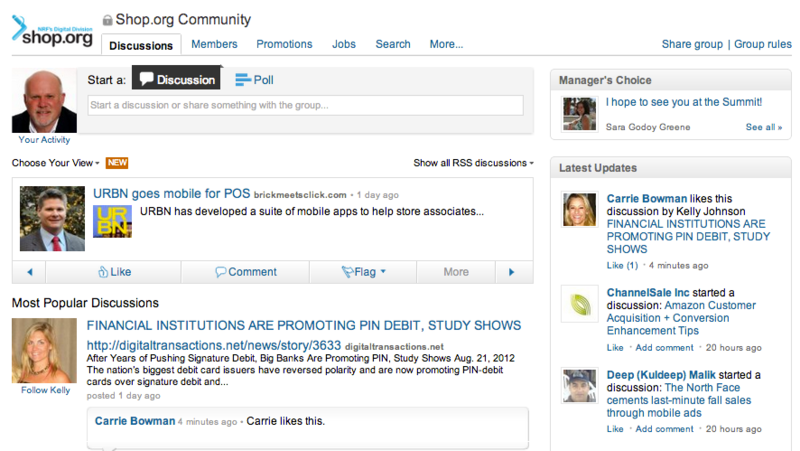 The Shop.org group provides a forum for ecommerce and multichannel retailers to share information. This is the official group for Shop.org, the digital division of the National Retail Federation. The term “official” means that it has passed LinkedIn’s review process and represents an established membership organization. The group provides a forum for ecommerce and multichannel retailers to share information, discuss emerging trends, research and network with peers. Discussions tend to be more industry-level, but provide high quality content, which is why I recommend it. Shop.org’s community is stringently monitored, so discussions that are not relevant to ecommerce, cross channel, and digital retail get deleted. Members who use the discussion board for marketing or self-promotion are removed as well. This group proclaims itself to be the “largest and most active Marketing Group with 457,000+ members.” It is managed by the eMarketing Association and is open to anyone interested in Internet marketing. With topics including social media, email, search, mobile and web marketing, this group goes beyond just ecommerce. I wish I could say the group is completely devoid of spam or promotional posts, but some do appear to get through. Overall, however — perhaps due to the size of its membership — the group is extremely active with many discussions and comments. For example, the post Social Media Has Ruined Marketing received over 2,200 comments. Managed by InboundMarketing.com, the educational arm of marketing software company HubSpot, this group bills itself simply as an “online group for marketing professionals.” It focuses on inbound marketing, search engine optimization (SEO) and social media. Even though it has over 82,000 members, comments are limited in number; many posts receive fewer than 20. Still, the content retains a high degree of quality, and with post titles such as “5 LinkedIn Group Rules To Live By” or “3 Ways Facebook Can Boost Your Online Presence,” it seems very practical. 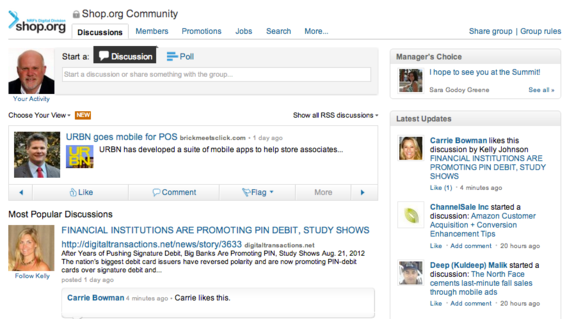 Social commerce platform Shoutlet owns this group, which targets social commerce. According to the group profile, all aspects of social commerce are under discussion including group deals, Facebook shopping, and social media return-on-investment issues. With 2,400 members, the group is smaller than the others mentioned above, but contains some high profile social commerce practitioners. The number of posts and comments tend to be fewer, too. Even though the group aims to be a “valuable source of insight for its members,” I wish it were more tightly monitored. Still, it is a good source of information on the topic of social commerce. I suggest giving it consideration. Small Biz Nation covers a variety of topics pertaining to small business interests. The group has a peer-to-peer focus where small business leaders can collaborate and share ideas. But it also has leading voices — industry technology experts from HP and Intel — that provide authoritative insights on relevant topics. Both posting and commenting activity is routine, robust and on-target. The group’s rules are extensive and managers appear to exert a high level of control over the content to ensure it stays within published guidelines. With 474 members, this is a newer, but fast growing, group. It is owned by Content Marketing Institute (CMI), an organization focused on the increasingly popular topic of content marketing. CMI is a reputable organization run by one of the chief evangelists for content marketing, Joe Pulizzi. I know Joe personally and can vouch for both him and his organization’s credibility, which is why I recommend this group. Another new LinkedIn group and one that, like Content Marketing Institute, represents an emerging field — content curation — is Content Curators. For those unfamiliar with the topic, content curation is the process of finding, organizing, and sharing content to support an organization’s objectives. This group serves as a forum to discuss content curation best practices, helpful tips, industry solutions, and overall insight into content curation and content marketing. 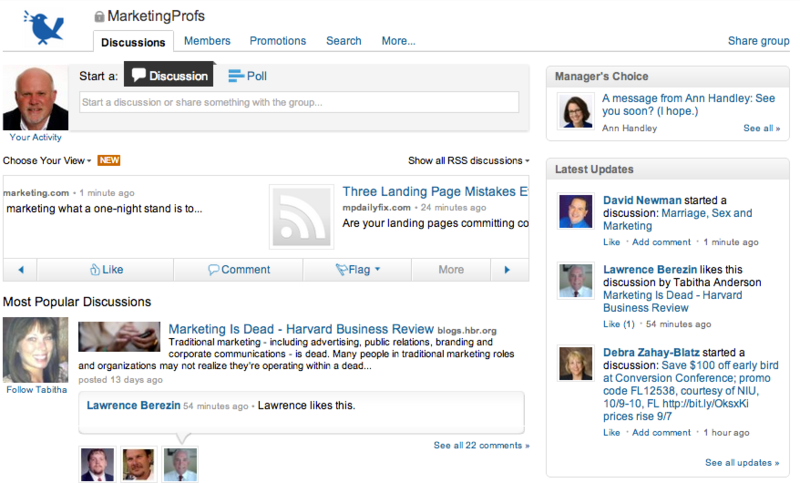 The group is hosted by Content Curation Marketing, an online resource for topics pertaining to curation. MarketingProfs contains a wealth of actionable marketing information. 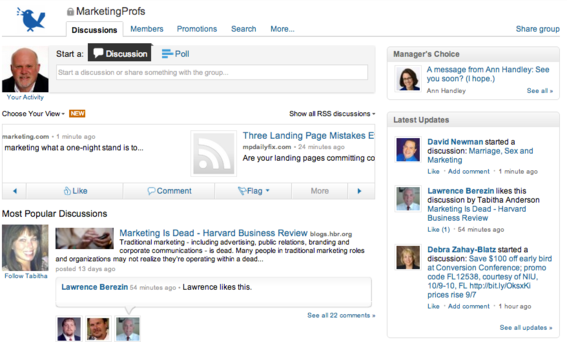 Though skewed more toward business-to-business interests, MarketingProfs’ LinkedIn group is not only one of the most active, but contains much marketing information. Managed by MarketingProfs’ chief content officer, Ann Handley, the group centers on actionable know-how and discussions. Last, but not least is our own group, Practical Ecommerce. The group is designed to be an extension of the website and provides a format for discussion on topics of concern to ecommerce merchants, vendors, software providers and others. Practical Ecommerce articles are also reposted here for both reference and discussion purposes.